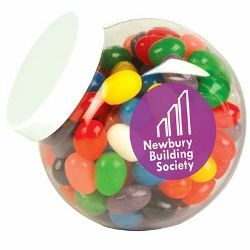 160 grams of corporate colour mini jelly beans in clear container with White lid. Choose from corporate colours – Green, Red, Orange, White, Yellow, Black, Pink, Purple, Blue. Printing: Price includes 1 colour print on White lid.